Passing through Newcastle city centre yesterday afternoon, I was able to see what was happening with several incoming stores that I’ve blogged about previously. 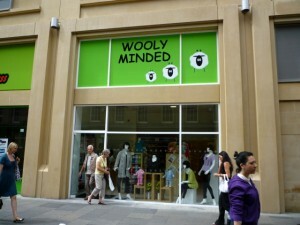 In Clayton Street, Wooly Minded has now been trading for a week or two, and indeed features the palette of flying sheep, lime green and black that I was earlier promised. 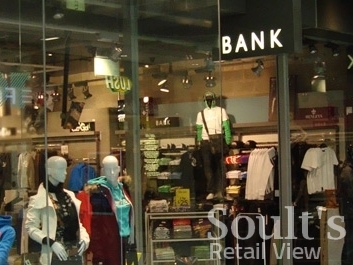 Still, the overall effect is undeniably eyecatching, and where Wooly Minded’s existing shops in North and South Shields are hampered by quite long, thin shopwindows, the Newcastle store’s full height glazing has allowed for a bolder, fresher treatment. 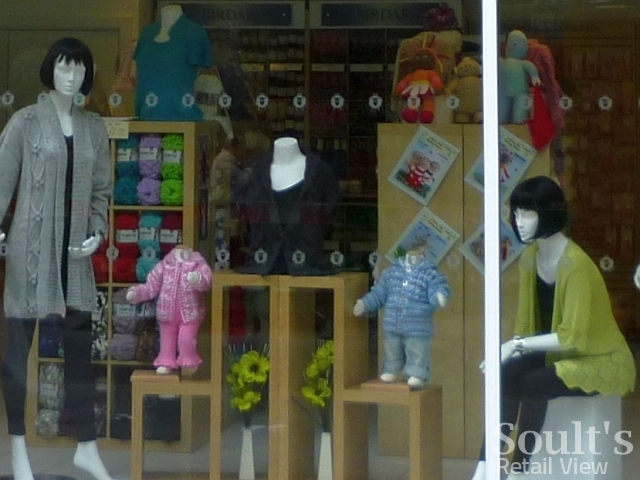 Crucially, while both the Shields shops feature densely packed window displays (including posters and signs stuck to the inside of the glass), the relative simplicity of the Clayton Street window treatment ensures that passing shoppers get a clear view into the shop. 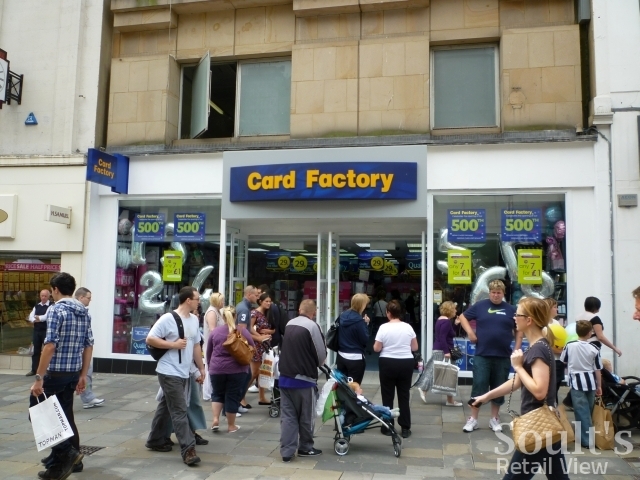 Another new store with bold signage is the recently opened Card Factory on Northumberland Street, whose blue and yellow fascia can never be termed discreet. The end result looks OK, however, with much of the shopfront and fascia kept as white, and is certainly an improvement on the tired Foot Locker frontage that it has replaced. 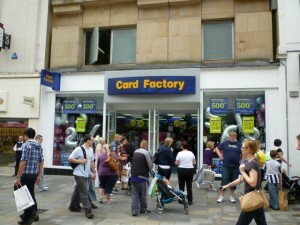 The shop is apparently Card Factory’s 500th store, and certainly seemed busy when I passed by. Despite its stone frontage, the property itself is arguably one of the ugliest in Northumberland Street – strangely ageless and devoid of character with its assymetrical facade and drab blank windows to the upper floors. If Card Factory’s bright shopfront stops people looking any higher up, it’s perhaps not such a bad thing in this particular instance. The final stop on this occasion is just a couple of doors further down Northumberland Street, where the JD-owned young fashion chain Bank – previously mentioned here – is now clearly announcing its arrival in the former Priceless Shoes unit. Offering what it describes as “the latest fashion for women and men from your favourite designer brands such as Paul’s Boutique, Lipsy, Superdry and Henleys”, I’m not quite clear how many of Bank’s brands simply duplicate names that are in the city centre already – Superdry, for example, has a prominent store of its own in St Andrew’s Way, while Lipsy and Paul’s Boutique are both available in Fenwick’s. 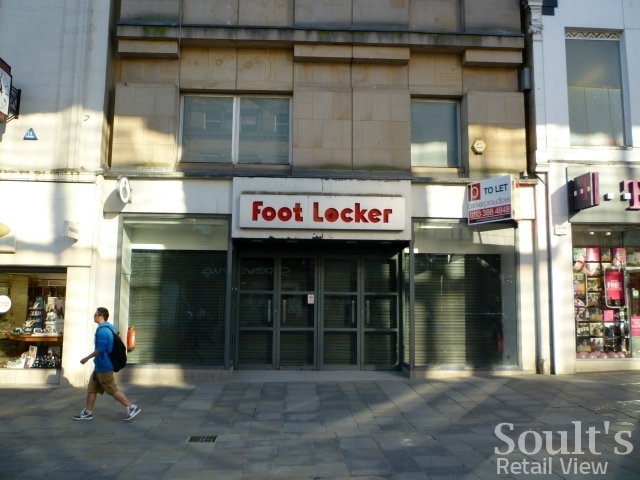 Still, with the nearest Bank stores currently in Middlesbrough and Stockton, it’s positive to see a new name coming to a prime site in Newcastle city centre. 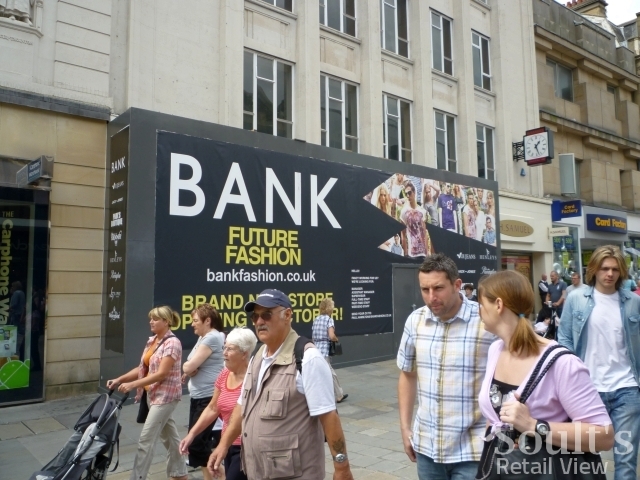 Perhaps more importantly, images on the retailer’s own website suggest that Bank stores have a modern, open feel that wouldn’t be out of place in the Eldon Square extension. 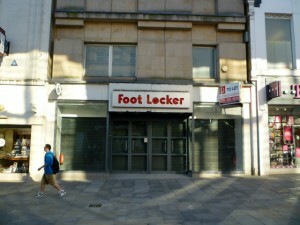 If the new Northumberland Street store looks anything like this, it should bring a little glamour to a location that, as Priceless Shoes, has had all the retail pizzazz of a jumble sale. That’s good Adam – I do hope the shop is a success, as the staff I met at the North Shields branch were lovely. The sign on the new shop could have been so much better though! I can only agree with the assessment of their sign, very cheap looking. The shop itself is unbelievably shallow in terms of space but was pretty busy when I walked by, in fact I heard a pair of older women chatting about the shop later on so it has definitely had a good impact. I agree! I always maintain that it’s worth independent retailers having a basic web presence, even if it’s just to provide contact details, opening times and a bit of background or history about the business. Having this blog showing up as the top search result for ‘Wooly Minded Newcastle’ is surely missing a trick! 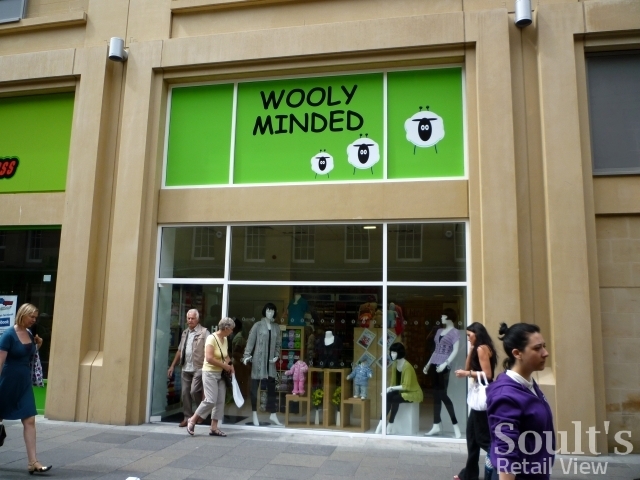 Found your site while looking for information on Wooly Minded and have to say I am seriously unimpressed by the signage too! 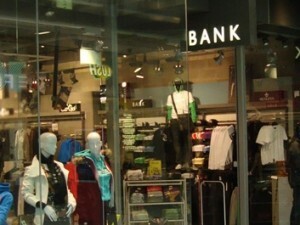 I went past the other day but was put off by the ghastly sign and the rather ‘naff’ feel of the shop. Most wool shops I have come across recently both locally and around the country are extremely modern, I shall leave further judgement until I have actually been inside. A lack of website or ANY information is disappointing.